The wet areas show where the mire has thawed out completely. Here methanogens thrive. Several billion years ago, before cyanobacteria oxygenised Earth’s atmosphere, there was a group of microbes called archaea which flourished in the warm, shallow oceans, letting out the greenhouse gas methane into the atmosphere. Today, most of the archaea’s descendants hide in places where oxygen cannot reach them. Many still produce methane. The methane-producing (methanogen) archaea in permafrost have led still lives in the frozen soil. The small amounts of methane they produced have stayed below the ice or have been consumed by methane-eating neighbours. The heating-up of the arctic regions has changed this status quo. The methanogens now have access to carbon dioxide and hydrogen which they convert into methane. The methane is let out into the atmosphere and contributes to further global warming. 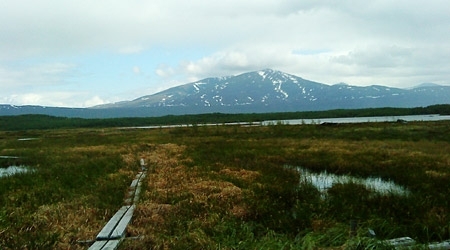 Previous research shows that the permafrost of the Stordalen mire has melted quickly over the last 30 years and that the mire emits an increasing amount of methane. Rhiannon Mondav, PhD student of limnology at Uppsala University, is part of the international research group which decided to look for methanogens in the mire. Several hundred samples of peat, water and air were gathered over several years and analysed. When Rhiannon Mondav analysed the peat samples she discovered a previously unknown methanogen. Together with the research group she mapped its genome and named it Methanoflorens stordalenmirensis. This newly discovered methanogen exists in such abundance that it made up 90 per cent of the archaea in the Stordalen mire. Methanoflorens stordalenmirensis feels so at home in the melting permafrost that it blooms, in a similar way to algal blooms. This is a previously unknown phenomena in methanogens, and since methane is a by-product of their metabolism it will have significant environmental consequences. “DNA fragments from this microbe have been found over the last 20 years, but no one knew what it did or who its closest ancestors were. What we have done is to figure out what it does and who it is related to”, says Rhiannon Mondav. Now that the new species has been described, it has been found to exist also in other peatlands and mires, contributing in a significant way to global methane production and thereby global warming. Methanoflorens stordalenmirensis manages surprisingly well in the acid peatlands with annual cycles of freezing, melting, flooding and drought. “Methanoflorens stordalenmirensis seems to be a indicator species for melting permafrost. It is rarely found where there is permafrost, but where the peat is warmer and the permafrost is melting we can see that it just grows and grows. It is possible that we can use it to measure the health of mires and their permafrost. The recently documented global distribution also shows, on a much larger scale, that this microbe spreads to new permafrost areas in time with them thawing out. This is not good news for a stable climate”, says Rhiannon Mondav.